St Helens Council is backing a local campaign to reduce incidents of knife crime in the borough, led publicly in St Helens by the family of 29 year-old Daniel Fox, who died after suffering a fatal stab wound in September 2016. 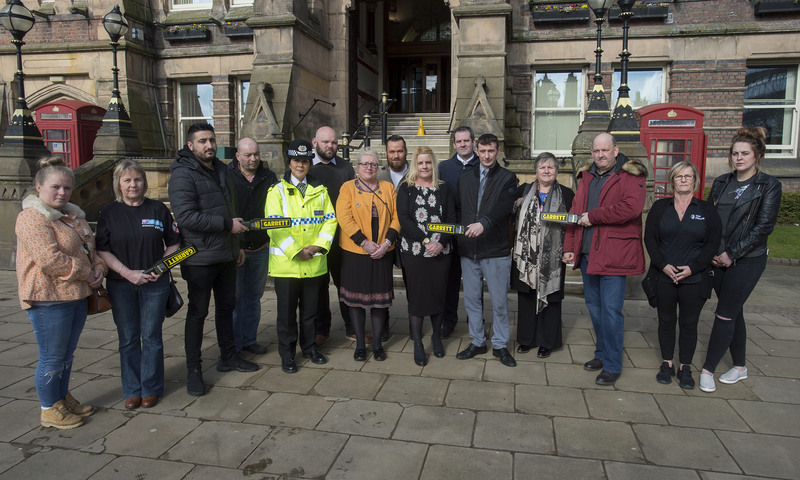 The campaign will soon see knife wands utilised by door staff at 27 clubs and bars in the town centre and across the borough as a further deterrent, keeping visitors to the night time economy safe. These handheld metal-detecting devices can be quickly swept over the body by door staff before entry. Local bar owners met with community safety partners at St Helens Town Hall to welcome the move, which is funded by St Helens Council. The #NoMoreKnives campaign was launched in December in Victoria Square by friends and family of Daniel Fox, who spoke of their desire to see young people steered away from carrying knives. “My life sentence started in the early hours of Friday, September 2, 2016. Looking forward, we hope to prevent other families going through this horrendous nightmare and the life sentence that we are now living, without our beloved son. Much of the council’s work on the campaign is focused on education, to be undertaken through schools with 12-16 year olds by St Helens’ Young Advisors – young people aged 15-24 who are locally recruited and professionally trained by the national Young Advisors Charity to provide links between professionals, young people and their communities. related injuries are caused by the victim’s own knife. This mind-set is misguided and creates dangerous and potentially lethal situations. Area commander for St Helens, Superintendent Louise Harrison, said: “Merseyside Police is committed to ensuring that the people who live, work and visit St Helens and the greater Merseyside area feel safe and reassured.